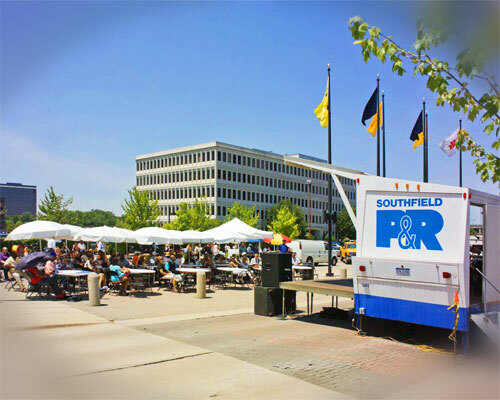 Southfield residents, workers, and visitors will again enjoy the opportunity to “Eat to the Beat” this summer in the Southfield City Centre Plaza. The annual series of free lunchtime concerts kicks off on Thursday, June 14 with Grammy-nominated local jazz favorites, Straight Ahead. The plaza, located on Central Park Boulevard between Civic Center Drive and the I-696 service drive, will be the site of the monthly outdoor concerts sponsored by the Southfield City Centre Advisory Board (CCAB) and the City of Southfield Parks & Recreation Department. “Eat to the Beat” takes place the second Thursday of each month (through September) from 12:00 p.m. until 2:00 p.m. Lunch goers can either brown bag it or purchase food from an on-site vendor. The performances are open to the public. This year’s concert series lineup includes a variety of musical genres: Australian blues singer Harper and his Michigan-based band Midwest Kind on July 12, Detroit Music Award-winning funk/rock group The Brothers Groove on August 9, and Detroit pop/R&B/rock musicians The Dave Hamilton Band on September 13.